A while ago, I translated a folktale called "The troll who did not carry his heart with him", starring a young prince, by the peculiar name of Askeladden. After some thought, I thought it might be of interest to elaborate who this Askeladden actually is. Being prominent in several Norwegian folktales, our paths will undoubtedly cross again. As the leading man in many of the tales, Askeladden is overall depicted as a hero, as many protagonists are. The character itself however, constitutes so much more than being a main figure in a fictional story. Even his name, Askeladden, has become a concept in Norwegian culture, promoting cultural norms and values which have been cultivated through the oral traditions, from one generation to the next. Han ville aldrig gjøre noget, bare ligge og grave i asken. 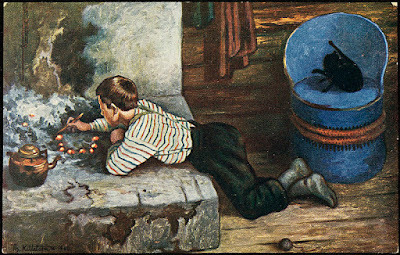 The fairytale which I quite freely have chosen to call “The boy, the troll and the porridge-eating contest”, is undoubtedly one of the most beloved and well known fairytales, in which Askeladden takes center stage. In Norway there are known to be as many as 27 variants of this story, and in 1841 it was published for the first time, by Norwegian collectors Peter Christen Asbjørnsen and Jørgen Moe. Although many Norwegians know this to be a highly Norwegian story, the formula of the tale is in fact internationally known and exists in multiple languages. 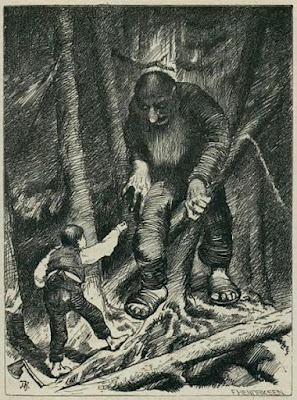 What perhaps characterizes the Norwegian version however, is the spontaneous encounter between a boy and a gigantic troll out in the woods. When poverty forces Askeladden to leave home and make his way into an unknown and dangerous realm, this troll becomes the ultimate antagonist which really puts our hero to the test. In this tale though, it is not a matter of conquering the troll with swords and bold bravery; here, the hero needs to outsmart the troll, in order to defeat it. In so doing, all the gold and silver in the mountain will be within his grasp, and he will be able to help his family out of debt and penury. Besides the prospects of material wealth, there's an additional aspect of this story which perhaps conctitutes the key aspect of the ashlad's motivation. For just as important is the portrayal of Askeladden as the young boy who no one expects anything of, who finally gets the chance to prove himself against his father and his two annoying, older brothers. It is a classic sibling drama really; the brothers, Per and Pål, are impetuous, assertive and dominating. In many ways, they might be seen as representatives of society’s conventions, believing that they know better, simply because they’re older. This perception does not exactly make much room for the autonomous thought, thus preventing them from finding creative solutions to the problem at hand. Askeladden, on the other hand, might initially appear to be a little silly and naive. When the story unfolds however, the youngest in the bunch proves also to be the wisest and more tactical. He also often proves to be thoughtful and aware of creatures in need. These qualities help him through his rough patches, and eventually contribute to his success. His imprudent and self-centered brothers on the other hand, stride forward without any thought for others but themselves; this conduct invariably proves to backfire, which ultimately either ends in ridicule or disaster. For the people listening to these stories, a sense of comfort and hope was to be found in Askeladdens accomplishments. As a poor wretch from humble beginnings, who triumphs against all odds and ultimately prevails were his older siblings fail miserably, Askeladden showed that one did not have to be rich and powerful to make it in this world. If you were smart, worked hard, and remained humble and thoughtful to those around you, everyone could win the possibility of a better future. Once upon a time, there was a farmer who had three sons. Old and frail as he was, his farm was beginning to deteriorate, as his sons were lazy, and did not bother to lift a finger. One day, however, the father commanded the boys to go out in the forest and chop some wood, for they had debt that needed to be paid off. After much ado, the boys finally agreed to cut the old man some slack. The first one to go was the eldest son. After finally entering the deepest parts of the woods, he began chopping a bristly, old spruce. Shortly thereafter, a big, burly troll came barging in from behind the trees. "If you're chopping in my forest, I will kill you!" the troll exclaimed. When the boy heard this, he immediately threw the ax away, and ran home again as fast as he could. Back in the house, panic-struck and quite breathless, he told his father what had happened to him. But the old man did not budge; the trolls had never scared him from chopping wood when he was young, he said. "If you're chopping in my forest, I will kill you!" he shouted. The boy hardly dared to throw him a glance, before he did just like his brother; he threw his ax and ran as fast his feet could muster. When he returned home, with the tale between his legs and nothing to show for, his father got angry; never had the trolls succeeded in scaring him from chopping wood! On the third day, the youngest son, named Askeladden, proclaimed that he wanted to give it a try. "You?!" the two eldest blurted out, "you should do well, you who have never been outside the doorstep!" Askeladden did not bother to answer his brothers, but asked instead for some food to bring with him. Having not much to spare, his mother gave him some bread and some cheese, which he put into his knapsack before he set off. "If you're chopping in my forest, I will kill you!" he roared. But the boy was no fool; quickly he hurried into the woods and fetched the cheese he had brought with him. Then he squeezed it, squirting whey all over the place. "If you do not keep quiet," he shouted to the troll, “then I'll squeeze you like I squeeze the water out of this white stone!" "Oh no, spare me," said the troll, "and I'll help you chop. "On that condition, the boy agreed to spare his life, and it turned out the troll was an excellent lumberman; many trees were felled that day. “then I'll squeeze you like I squeeze the water out of this white stone!" Toward the evening, the troll said: "Now you can come home with me, it's much closer than to your place." So the boy joined the troll, riding on his shoulder back to the trolls’ cave. When they arrived, the troll said that he could make up the fire, if the boy would only bother to fetch some water; but the two iron buckets were so large and heavy that he could not even manage to budge them. So the boy said: "It is not worth bringing along these thimbles; I think I’ll rather go for the entire well." "No, dear," said the troll, "I cannot lose my well. Make the fire, and then I will get the water. "When he returned with the water, they made a huge pot of porridge. Then the boy wondered if the troll would be interested in a porridge-eating contest? "Oh yes!" answered the troll; for this one, he could easily win, he thought to himself. And so they sat down to eat; but the boy managed to sneak to him his knapsack, and tied it to his belly. This way, he could scoop more porridge into the knapsack than he ate himself. When the basket was full, he took up his knife and ripped a gash in it. The troll watched him closely, but said nothing. When they had eaten for quite a while, the troll put down his spoon. "I give up, I can eat no more," he said. "But you must!" replied the boy; "I'm barely half full yet. Do as I did, and cut a hole in your stomach; then you can eat as much as you want." "But that must be dreadfully painful?" asked the troll. "Oh, nothing to speak of," replied the boy. And so the troll did like the boy said, and as you might have guessed, he ended his own life right then and there. But the boy took all the silver and gold to be found in the mountain, and brought it home to his father. Now they might very well be able to pay off some of the debt.